Mary only ever paints in her studio in London, where she produces paintings from her numerous sketchbooks and from many objects she has collected. Here we see her sketching in her garden by the Thames, completing two paintings in gouache and working in oils. We also see her producing one of her delightful collages. This film is a fascinating look at a remarkable painter with an instantly recognisable personal style. 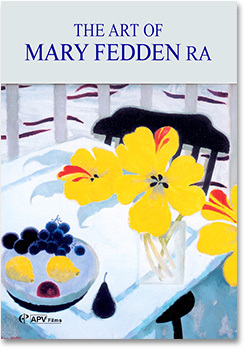 The colourful paintings of Mary Fedden are internationally acclaimed. Elected as a member of the Royal Academy in 1994, she is one of this country's most well known artists and, having featured on Tesco's 'Bag for Life', her work has had huge national exposure. 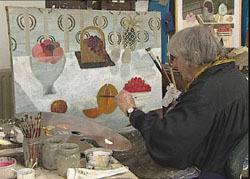 Continuing APV Films's successful series of videos focusing on Royal Academicians, The Art of Mary Fedden RA gives us insight into her development as an artist and her particular approach to painting. As a student at the Slade she was greatly inspired by a Russian tutor who had worked with the Bolshoi ballet. Mary was seduced by the luscious colour of the stage sets at the time, some of which she assisted in producing. Although her love of colour is still evident in her work painting, rather than theatrical design, remained her passion. The video shows her working on five contrasting pieces, beginning with a drawing in her garden overlooking the Thames, She moves on to a gouache, based on an oil painting of a landscape in County Cork; a large still life: a collage; and finally, a second still life. Together these demonstrate the variety in her working methods. She never paints away from her studio, although she always keeps a sketchbook in her pocket. When working on her paintings she uses these, in addition to printed reference and her own imagination, to bring her images together. Although she is constantly inspired by many different artists, her earliest influences, Matisse, Bonnard, and particularly Braque, are still in her work. 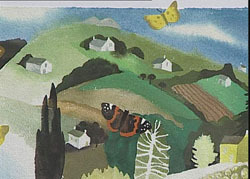 To add texture to her Irish landscape, she applies painted butterflies separately as in a collage. This technique allows elements to 'come off the� page', and adds depth. She doesn't feel the need to use naturalistic colour, but creates a harmonious image using a relatively limited palette. In her more monochrome collage, she uses pieces cut or torn from off-prints, selected from work by her late husband Julian Trevelyan. She composes them like a jigsaw, ensuring that the image does not get too cluttered. Finally, her still life, this time in gouache, exhibits her characteristic flattened and distorted perspective, resulting in an elegant, stylised image. It is fascinating to see how her ideas come together, and such knowledge will enable the viewer to gain even more pleasure from looking at her work. Furthermore, Mary's enthusiasm will no doubt encourage some to try out a few of her ideas for themselves. Although Mary Fedden travels widely and her subject matter comes from a rich variety of sources, she only ever paints in her studio in London. But, as she explains in The Art of Mary Fedden, she is never without a sketchbook. She has hundreds, and it is in these that she collects the resource material, ideas and inspiration for most of her paintings. Sensitively produced by Anthony Parker, this absorbing film begins with Mary sketching in the garden of her house by the Thames, where she has lived for over 50 years, and it goes on to show her painting in gouache and working in collage. Her work is full of imagination and personality and it is all about taking risks. "If I work away from the landscape I can use my imagination more," she says With many references to other paintings in Mary's studio and lots of interesting anecdotes, this film provides a fascinating insight into the life, philosophy and distinctive style of this well-known artist. There are currently no reviews for this product. Why not submit a review?